Gold Mark Farm LLC’s graded stakes winner Vexor makes his three-year-old debut in the $50, 000 OBS Sprint Stakes as OBS holds its 23rd annual Day of Champions race card on Monday, March 12th. The four races, for three-year-olds who have gone through the ring at an OBS sale, which will be run overOBS’ all-weather Safetrack surface, offer purses totaling $300,000 and will be streamed live via the OBS website at obssales.com. Post time for the first race is 1:00 p.m.
Vexor heads a field of six in the OBS Sprint. Idle since the Spectacular Bid Stakes at Gulfstream in December, the Florida-bred colt by Wildcat Heir outfought fellow OBS graduate Trinniberg to win the Nashua Stakes (G2) at Belmont Park last October. 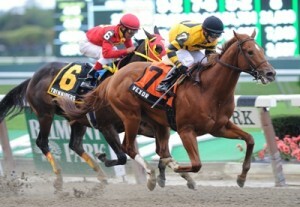 Trained by Todd Quast, Vexor will be ridden by Rajiv Maragh. Quintessential Racing Florida LLC, Hors’n Around Racing Stable and R. Lederman’s Making Amends makes his three-year-old debut in the OBS Sprint for trainer Mark Casse. Winner of Woodbine’s Clarendon Stakes in his first start and third next out in the Vandal Stakes, the colt by Repent comes into the Sprint with a bankroll of $128,146. Here are the horses and riders in post position order for the six furlong race for 3-year-old colts and geldings; River Card Stable’s Mukamer, Luis Contreras; Robert and Sherleen Hall’s Trippi’s Secret, Elias Peltroche; Donald R. Dizney’s Devoted Wildcat, Kent Desormeaux; Vexor; Tom Gregerson’s It Takes Heart, Daniel Coa; Making Amends. All will carry 122 pounds. Priscilla Vaccarezza’s My Due Process heads a field of eight in the $50,000 OBS Sprint Stakes for fillies, coming into the race off a third place finish in Gulfstream’s Madcap Escapade Stakes in February. Winner of the NATC Futurity last summer at Monmouth, the daughter of Henny Hughes is trained by Dale Romans and will be ridden by Manoel Cruz. Julien Leparoux rides Raroma Stable’s Runfor Ro, supplemented to the race by trainer Greg de Gannes. The daughter of Afleet Alex, idle since November, was on the board in three stakes at Woodbine at two. John Oxley’s Delightful Magic, beaten a nose in Tampa’s Gasparilla Stakes in January, warmed up for the Sprint will a bullet five-eighths over the OBS track for trainer Mark Casse. She’ll by ridden by Luis Contreras. Horses and riders in post position order for the six furlong race for 3-year-old fillies:Gold Mark Farm LLC’s Xunlei, Rajiv Maragh; Runfor Ro; Gainesway Stable’s Direction, John R. Velazquez; My Due Poocess; Delightful Magic; West Point Thoroughbreds’ Quality Lass, Patrick Husbands; Gary Jackson and M and G Stable’s Backstage Magic, Jose Garcia; Ron Henrickson’s Who Is Camille, John R. Velazquez. All will carry 120 pounds. Wayne A. Dacosta’s Given Enchantment heads a field of twelve in the afternoon’s third race, the filly division of the $100,000 OBS Championship Stakes. Second to fellow OBS graduate Yara in the Joe O’Farrell Juvenile Fillies Stakes at Calder, the Florida-bred daughter of Pont Given, trained by Jason Dacosta, will be ridden by Luis Jurado. Here are the horses and riders in post position order for the mile and a sixteenth race for 3-year-old fillies: Terry Davie and R. Carter’s Let’s Go Donna, Manoel Cruz; The Posse’s She’s Copacetic, Joe Rocco; Jonathan Rey, Javier Sarmiento and Dante Zanelli, Jr.’s Oaks Lily, Julien Leparoux; AJ Suited Racing Stable’s Normative Appeal, Angel Serpa; John C. Oxley’s Golden History, Luis Contreras; Lone Stable LLC’s Parranda, no rider; Gold Mark Farm LLC’s Xunlei, Rajiv Maragh; Gainesway Stable’s Direction, John R. Velazquez; Terra Di Sienna Stable’s Ten K Cat, Elvis Trujillo; Marc Haisfield’s Andrew’s Girl, Leandro Gonclaves; Tippie Tap, Luis Garcia; Given Enchantment. Stakes winners Big Wednesday and Hello Prince head a field of eleven in the $100,000 OBS Championship Stakes for colts and geldings. Martin Brothers Inc. and Napier Stables LLC’s Big Wednesday, winner of the Fitz Dixon, Jr. Memorial Stakes at Presque Isle last October, comes into the race off an unplaced finish in the Southwest Stakes (G3) at Oaklawn. Trained by Joseph R. Martin, the Florida-bred son of Repent will be reunited with rider Pablo Morales, who rode him to victory at Presque Isle. Rey Wan Racing’s Hello Prince, taken down from second in a roughly run Needles Stakes at Gulfstream last time out, had romped by six lengths in Calder’s Birdonthewire Stakes in his final start at two. The Florida-bred colt by Halo’s Image, trained by Daniel Pita, will be ridden by Jose Garcia. Trainer Todd Pletcher has supplemented Bortolazzo Stable LLC and Wind River Stables Big Blue Nation to the OBS Championship. After winning at first asking, he was third behind OBS graduates Currency Swap and Trinniberg inSaratoga’s Hopeful Stakes (G1) despite a slow start. The Bluegrass Cat colt will be ridden by John R. Velazquez. The horses and riders in post position order for the mile and a sixteenth race for 3-year-old colts and geldings: Signal Hill Farms’ Mucho Mas Mucho, Juan Leyva; Big Wednesday; Jay F. Young and Keith C. Dickey’s All for the Trip, Pedro Cotto; Judy and Jim Spicknall’s Last Prayer, Juan Delgado; Patrioticandproud, Rajiv Maragh; Hello Prince; Dennis J. Manning’s Crafty Unicorn, Angel Serpa; Big Blue Nation; John C. Oxley’s Moon Traveler, Luis Contreras; Jose Pinchin’s Here We Go Joe, Elvis Trujillo; Ken and Sarah Ramsey’s Burn the Mortgage, Julien Leparoux. All will carry 122 pounds. Posted to Sales News, Uncategorized.